One solemnity not rearranged to fall on a Sunday is that of the Sacred Heart of Jesus. This once very popular devotion has declined in the last 50 or so years. There are probably many reasons, but certainly the cause lies in part to the often saccharine nature of the devotion in its practice and iconography, and to a notion that this devotion was so late in developing as to represent a deformed branch of the Catholic tree, especially as one is apparently hard-pressed to find any warrant for the devotion in Scripture. And, as has been said more than once, why adore a heart? Of course we are not adoring the physical heart-flesh of Jesus (although, think about it…); we adore what it represents, namely the sacred humanity of our saviour, Jesus Christ. We cannot adore Jesus in his divinity without at the same time adoring his humanity, because they are indivisibly one in his sacred Person. The concept needs to be absorbed: we can actually adore humanity. (But only Christ’s humanity – sinless as she was, the humanity of the Virgin Mary is not to be adored, only honoured.) It is this sacred, adorable humanity of Jesus which the Sacred Heart symbolises and reminds us of. In this human heart of Jesus we find the true nature of divine love, and so too human love, for it is to the one love that we are called. It is the love that is expressed in self-sacrifice, and there is no greater love than this, for it is the love God showed for us in Christ. If you are so minded you can read last year’s post on the Sacred Heart, which offers a fuller examination of the significance and enduring relevance of the Sacred Heart. 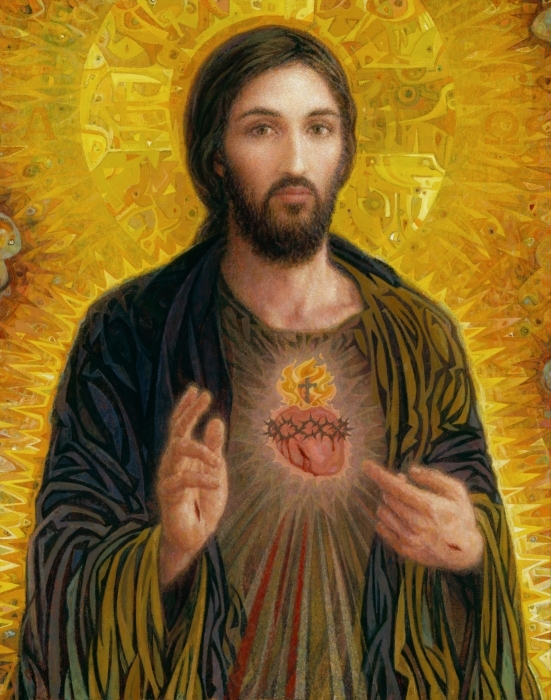 Here, let it suffice to conclude with this word: the Sacred Heart of Jesus shows us the near-inexhaustible capacity of the human heart to love. The Sacred Heart teaches that obedience to the Father’s will, however great the suffering this entails, gains for us a grace that, if we use it, can enable us to love even unto to death, as Jesus did, and ultimately to be exalted by that same love, as Jesus was that first Easter Sunday. It shows us that, with grace, no love is beyond those who obey the Father, in union with Christ, and thereby empowered by the Holy Spirit. I love the picture of the Sacred Heart. Can you post the name and location of this icon? It is lovely, isn’t it. There is a matching one of the Immaculate Heart of Mary. You have reminded me (shamed me!) to put an acknowledgment and a link. The icon is from Smith Catholic Art and it is possible to buy various “hard” copies at their website. Found it! Thanks for following up.